Daylight Savings is coming up – Saturday, Nov. 5. We have heard reminders for years that this is a good time to change the batteries in your smoke detectors, and we think it’s a good time to remember to do some other important things around the house. Winter is right around the corner, and your windows can be a significant source of energy loss if problems are left undetected. Windows are one of our favorite home features, and while we don’t sell windows, we do replace glass. Spending a few minutes now can prevent a loss of heat and a warmer house all winter. Check your storm windows. Now is a good time to install or shut storm windows – they can serve as an excellent insulator and prevent air flow through your windows. Add caulk. Caulking around windows, especially if there are gaps or holes, is an excellent insulator. Repair broken windows. 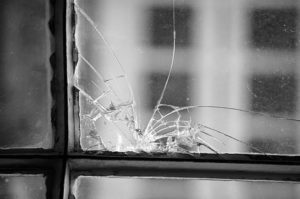 If your glass is cracked, call us – we can replace it! If window frames are bent, now is the time to fix them. You want a nice, tight fit on all window elements to prevent heat loss. Consider window treatments. Blinds or shades, particularly cellular shades, will allow in natural light but serve as another barrier to cold air. Add a draft snake. A draft snake is a fabric tube that can be placed under a door or on a window sill to further prevent air from escaping, or coming in, especially if there is a small gap. A good thorough check of your windows now will help you stay warm and comfortable all winter. Call Quality Glass today if your glass needs to be replaced. If you are interested in replacing windows – we will refer you to one of our trusted partners. A little time spent now will be worth it all winter – and don’t forget, you get an extra hour of sleep!